Stuart Broad added a touch of international class to Nottinghamshire’s performance at Headingley, but it was the troubled side’s only consolation as they slipped to an innings defeat against the reigning champions inside three days. Broad claimed both overnight centurions, Andrew Gale and Jack Leaning, in his first spell with the new ball, and then returned to clean up the tail. 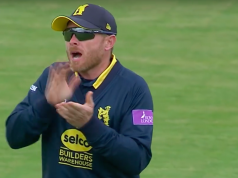 His teammates denied him the opportunity of bowling a hat-trick ball, however, after they failed to eradicate Yorkshire’s 206-run lead – he top-scored with 50 but was unable to make Yorkshire bat again. With a combined age of 68, Tim Bresnan and James Middlebrook are far from being poster-boys for Yorkshire’s youth policy, but they negotiated a tricky period of play after Broad (and Luke Wood, who bowled Bairstow with an inswinger) with admirable steel and grit. They had added 43 in less than nine overs when Ben Hilfenhaus induced a thick edge off Middlebrook’s bat to have him caught at second slip. Yorkshire coach Jason Gillespie has, in his own words, “copped it” this week for referring to Australia’s Test side as “Dad’s Army”, but he must have been grateful for today’s contributions from his own old-timers. Steven Patterson is not in the first flush either, but together with Bresnan he put together 50 runs for the eighth wicket before he dangled his bat to Stuart Broad and was caught behind. After lunch, Broad tested Jack Brooks with a barrage of short balls, which the Yorkshire seamer did well to avoid. He pitched a ball up that left the tailender clueless and had him caught at slip. With his very next delivery, he trapped Ryan Sidebottom leg before, and the umpire’s finger was raised after one of Broad’s trademark effusive appeals. His figures of 7-84 were his fourth best in first-class cricket – another cog falling promisingly into place for England’s Ashes preparation. Ryan Sidebottom has never featured in an Ashes Test, but he is a far better bowler than many who have. On his first game back from a long injury layoff, he struck twice with the new ball to plunge Nottinghamshire into deeper trouble after starting their second innings with a 206-run deficit. First, Brendan Taylor was caught well in the gully by James Middlebrook, and then Steven Mullaney hung out his bat and gave Jonny Bairstow an easy catch. James Taylor only got off a pair with his 16th ball, but he didn’t get into double figures after Steven Patterson trapped him with a full, straight ball for a 33-ball six. Wessels and Lumb rebuilt positively, Lumb in particular stroking some attractive drives through the off side, but the partnership was ended when Wessels did not commit fully to a drive and Bairstow took a fine diving catch in front of first slip. Nottinghamshire were still in trouble, but they were going down fighting. Lumb’s knock came to an end when he was adjudged lbw to Bresnan for 47, but it was Will Gidman’s innings that epitomised Nottinghamshire’s failure in this match. It only lasted six balls, but there was time for a return catch to fall short of Steven Patterson before he tamely flicked Bresnan to forward square leg for nought. 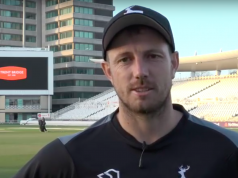 A star all-rounder for Gloucestershire in division two for many years, Gidman appears to be taking time to find his feet in the top flight, with an average of 16.81 with the bat and 64.75 with the ball. Samit Patel, their last batsman of note, was out on the stroke of tea as Alex Lees took a high catch leaping to his left. Ryan Sidebottom fired one through Luke Wood’s defences to bowl him for 12. Accompanied by Hilfenhaus, Broad moved to Notts’ highest score in the innings with the fearlessness of a tailender in a hopeless position. He survived a missed stumping on 42, but moved to 50 with a cover drive off former England colleague Tim Bresnan. He was out shortly after, smashing Middlebrook but only finding a splendidly diving Andrew Gale at midwicket. The game was over when Hilfenhaus followed up a slogged six with a slogged out, caught by Sidebottom at mid-off. It would take a staunchly glass-half-full type to find many positives in this match for Nottinghamshire. Stuart Broad was magnificent, but they won’t see him again for a while. Luke Wood looks like a good prospect, but he is some way off being able to lead the team. They have underperformed in this match, in this season, and their place in division one is now under serious threat: they slipped to bottom place after Worcestershire held out for a draw at Uxbridge. Yorkshire, on the other hand, move into second place with a game in hand over the leaders Durham.